Skin & Threads is an Australian clothing label which specialises in wearable, comfortable and affordable, luxurious casual separates. Skin & Threads take pride in sourcing 100% natural fibres, making them a first choice product for people who want quality garments that last and last. I know by personal experience, that if you purchase an item from Skin & Threads, it will stay in your wardrobe for years to come. The quality is second to none! Skin & Threads sell basics that can be worn layered, on their own and with other pieces in your existing wardrobe. I love their crew neck, superfine merino wool long sleeve tops, because I like to layer them underneath dresses and sweaters! 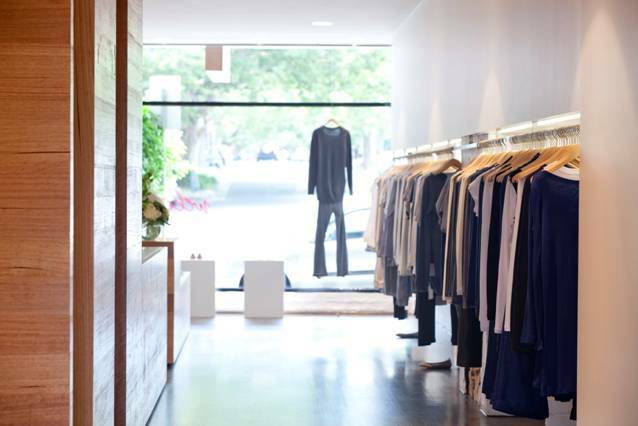 There are Skin & Threads stores across Victoria, as well as boutiques which stock the label throughout Australia. For those of you who live overseas, there are also stockists in Canada, Japan, New Zealand and the USA. In conjunction with this, Skin & Threads is available for purchase online! Skin & Threads are opening up a "pop up" store on Little Collins Street in Melbourne! Make sure you "pop" in to check out their fabulous AW '12 range! I enjoy shopping at Skin & Threads in High Street, Armadale in Melbourne. The staff are always friendly, knowledgable and are there to offer style advise in a professional and approachable manner. I always feel like I'm catching up with an old friend when I pay them a visit! Hope you're enjoying your weekend! Are you doing anything exciting? Definitely essential pieces for your wardrobe! Hi! beautiful & elegant look, really urban & cool! Thanks for your comment Robert! Skin & Threads are certainly the label to wear for casual elegance!! Skin & Threads are an amazing label! Thanks so much for your lovely comment & for following me. Thanks for your comment! The pictures are courtesy of Skin & Threads. Some beautiful knits there- perfect for Autumn! Yes, S&T are so perfect for AW! In fact, their garments are very transeasonal.